Lake Cable manufactures very high quality, high performance RoHS-compliant Broadcast and Pro A/V cables, right here in the USA! Their manufacturing processes, quality control, and fast turnaround make them second to none for Broadcast and Pro Video and Audio cables. 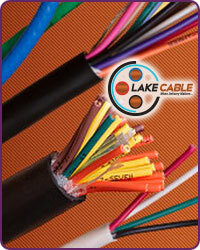 Lake manufactures great cable for markets beyond Broadcast and Pro A/V as well: cables for commercial construction, residential construction, home theater and automation, and security & fire. If there is a Lake Cable product you need that you don't see here in our store, just send us an e-mail or call us at (888) 999-4283 and we'll get it for you!